Ernest Stamm was born on July 18, 1931, in Butte, Montana. He entered the U.S. Naval Academy in June 1950, and was commissioned an Ensign on June 4, 1954. His first assignment was as a Division Officer aboard the destroyer USS Lyman K. Swenson (DD-729) from July 1954 to June 1956, followed by flight training from July 1956 until he was designated a Naval Aviator in June 1957. LT Stamm next served as an F9F-8B Cougar, FJ-4B Fury, and A-4 Skyhawk pilot with VA-56 at NAS Miramar, California, from December 1957 to October 1960. 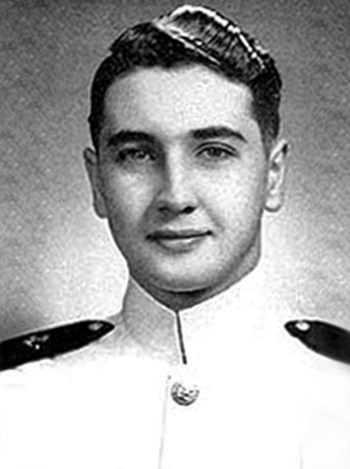 After attending Nuclear Weapons Training, he served as Special Weapons Officer on the staff of the Commander, Carrier Air Group FIVE from December 1960 to July 1962, followed by service as an instructor with the Navy ROTC detachment at the University of South Carolina from August 1962 to August 1965. LCDR Stamm next served as a ferry pilot with VRF-31 at NAS Norfolk, Virginia, from August 1965 to March 1967, and then completed RA-5C Vigilante Replacement Pilot Training with RVAH-3 at NAS Sanford, Florida, from March to November 1967. CDR Stamm served as an RA-5C pilot with RVAH-5 from November 1967 until he was forced to eject over North Vietnam and was taken as a Prisoner of War on November 25, 1968. He died in captivity on January 16, 1969, and his remains were returned to the United States on March 13, 1974. Capt Stamm was buried at the Holy Cross Lutheran Cemetery in Collinsville, Illinois. 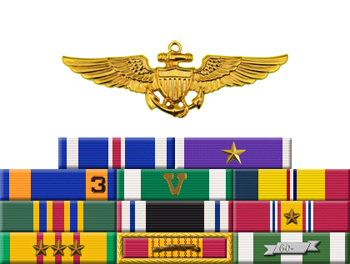 For heroism while participating in aerial flight on 25 November 1968 with Reconnaissance Attack Squadron FIVE, embarked in USS CONSTELLATION (CVA-64) during combat operations in Southeast Asia. As the pilot of an RA5C aircraft, Commander Stamm led a photographic mission over North Vietnam in support of a special reconnaissance program. In the face of a rapidly building antiaircraft-artillery barrage and continuous tracking by enemy fire control radars, he skillfully maneuvered his unarmed aircraft along the prescribed route to gain complete photographic coverage of the assigned objective areas. Commander Stamm's aircraft was hit by enemy ground fire and immediately became uncontrollable, forcing him to eject into a hostile area. His professionalism, superb airmanship and steadfast courage were in keeping with the highest traditions of the United States Naval Service.